Investment volumes within EMEA draws a very mixed picture despite an overall reduction in both deal-flow and volumes. Over the year, there was a 50:50 split between those which saw investment activity rise, versus those reporting a reduction in trading, In the Balance 2017 EMEA report shows. Across EMEA industrial/logistics investment has gained in popularity from 10.9% to 11.5%. Meanwhile, the Slovak and Czech markets were both the largest origins and destinations of CEE cross-border flow in 2011-16, according to the CEE Real Estate Investment Compass 2017 by Coilliers International and CMS. Poland is still the largest recipient of flows but the other countries are growing faster, capturing share. Very noticeable amongst the estimated Q1 2017 figures is the high 62% share of the Czech Republic. The Industrial sector has seen the biggest incremental growth in the last 6 years, whilst Retail flows are yet to overhaul Office. Retail might well do so in 2017. A marked shift in the origin of flows is evident in 2016, compared to previous periods in this cycle. South Africa, Asia and flows from domestic/CEE sources are now larger than those from G10 countries. Preliminary indications from the first quarter of 2017 suggest continued significant local investor activity in Hungary and the Czech Republic and the entry of Thai investors into the latter and Poland. Striking is the rise of domestic and CEE cross-border flows, up from EUR 1.1bn combined in 2011 to EUR 2.6bn in 2016. Within the region, Czech and Slovak domestic flows more than doubled in the period. The share of Office transactions in the CEE Investment pie has remained broadly steady around the 40% mark (39% in 2016), as the absolute value of transactions has of course grown. The most impressive increases seen in the last year were in the Czech (EUR 1.7bn in 2016 versus EUR 556m in 2015) and Hungarian (EUR 939m versus EUR 291m) marketplaces. 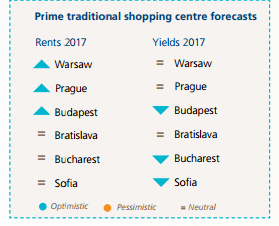 Prime rents in both Industrial and Logistics arenas are firming, especially in Prague and Budapest. Vacancy rates remain low across CEE, although this indicator is less useful than in Office given the higher proportion of “built-to-suit” developments. Low vacancy applies also to key regional markets in Poland and the Czech Republic. Given the push into the region from e-commerce companies amongst others in the past 3 years, the dynamics outside of the capital cities will become increasingly important in the future. Read more.